Custom-Imprinted Beer Steins & Root Beer Mugs! 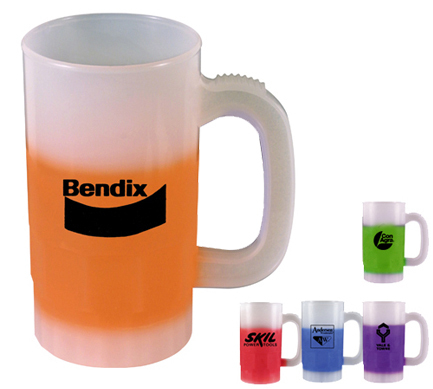 These Plastic Beer Steins & Root Beer Mugs are perfect for bars, restaurants, clubs, fraternities, sororities, promotions, and much more. Customized Beer Steins & Root Beer Mugs add a unique and fun touch to any event. 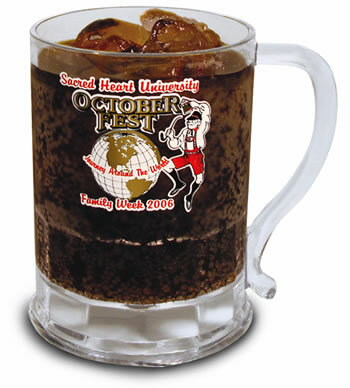 Our Plastic Beer Steins & Root Beer Mugs are made in the USA of durable acrylic to ensure long use. Your satisfaction is guaranteed when you order custom glassware from us. RB716 16oz Root Beer Mug 2.45 2.29 2.17 2.13 2.07 1.99 3" 2"
77014 14oz Beer Stein 1.19 0.93 0.89 0.85 0.83 0.9" 2-1/4"
77514 14oz Nite-Glow Beer Stein 1.45 1.37 1.05 0.99 0.93 2-3/6" 2-1/4"
77022 22oz Beer Stein 1.59 1.51 1.43 1.37 1.35 2-7/8" 3-1/8"
77550 14oz Mood Beer Stein 1.47 1.33 1.27 1.23 1.19 2-3/16" 2-1/4"
Orange, Red, Blue, Purple, Green.